Thankfully, Dana Rubenstein of Capital New York provides some theories. 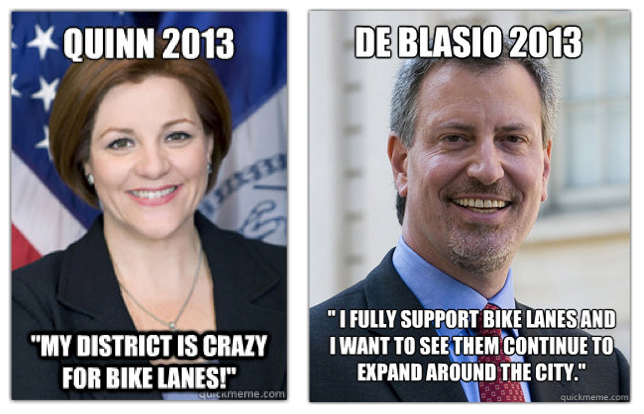 …the candidates have their reasons for criticizing the administration’s bike policy, beyond whatever sympathy they actually have for people who find it annoying. For one thing, the city’s tabloids, ostensibly channeling the anger of car owners, have staked out deeply unfriendly positions toward bike lanes, and toward their proponents. More importantly, all of the candidates, but particularly the ones interested in winning the Democratic primary, must say that they intend to do things differently and better than the incumbent has. So as is the case with policing (where almost all the Democratic candidates support stop-and-frisk in some form) and education (where all the Democratic candidates support Bloomberg’s signature achievement of mayoral control), they express displeasure with the status quo and talk about making the decision-making process more democratic without actually promising to reverse course completely. She’s right on both counts. It’s a shame that the need for an endorsement from the Post or Daily News trumps a sound investment in safety and an investment in New York’s future economic health, but that’s to be expected when no Democratic candidate has the deep pockets of a Bloomberg. It’s an even bigger shame when the desire to be “not Bloomberg” means that a program that has the power to save lives get thrown under the bus. It’s like Mitt Romney trying to distance himself from his signature achievement, health care. Yes, it may placate an angry base and get you through the primary, but it makes for some seemingly untruthful statements and contradictory beliefs.